Inscribed black leather Bible that belonged to Carry A. Nation, a devout Christian and nationally recognized temperance advocate. 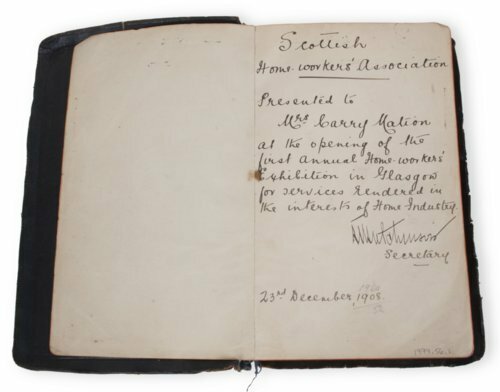 The Scottish Home-Workers Association presented this Bible to Nation on December 23, 1908, while she traveled through Great Britain on a speaking tour. Nation, a resident of Medicine Lodge, Kansas, was internationally known for attacking drinking establishments with a hatchet to discourage drinking. Nation was frequently jailed for her acts of vandalism. The inscription in this Bible reads, "Scottish Home-workers Association. Presented to Mrs. Carry Nation at the opening of the first annual Home-workers Exhibition in Glasgow. For services rendered in the interests of Home Industry." On the back pages, Nation made penciled notes regarding certain passages that reference infidels, woman, the curse of wealth, and the Republican Party. Callie Moore, Nation's niece and protégé, accompanied Nation on the British speaking tour and later owned this Bible.